The seabird season starts again! Over the summer months the cliffs at Fowlsheugh become home to thousands and thousands of seabirds. Having spent the winter out in the Atlantic the razorbills, guillemots, kittiwakes, fulmars and the odd puffin or two have returned to our shores to breed and it’s a sight not to be missed! The colony erupts into a feast for all the senses – there’s no mistaking the smell of a seabird city! Woo hoo! Fowlsheugh's been awarded a Certificate of Excellence! We're excited to announce that Fowlsheugh has been awarded a Certificate of Excellence on TripAdvisor! We are really grateful to everyone who takes the time to give us feedback and really pleased to read all your nice comments. We can only take some of the credit as it's the seabird city spectacle and the full sight, sound and smell experience that is responsible for so many people loving the reserve. 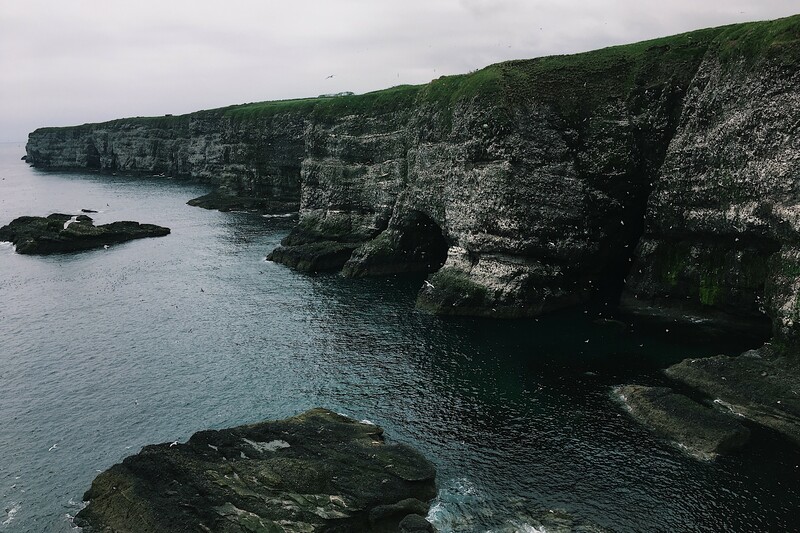 Derren Fox and Kirsty Nutt describe the seabird breeding season success at both Fowlsheugh and Troup Head and why Scotland's seabirds are still struggling. Eleven "dancing walkers" (or is that "walking dancers"?) joined Mark on a calm, warm and eventually sunny evening on the cliffs. Before we started I was told that they really, really wanted to see Puffins - so no pressure!! Another beautiful evening on the cliffs! Last night (Thurs 30th) saw 9 participants join Mark and Amanda in warm sunshine at Fowlsheugh. Kittewakes were finally getting their act together and collecting grass on the cliff tops to remake their nests - a month late!Large numbers created blizzards of white as they wheeled around before re-landing on the grassy tops to collect again. Open For Business & Pick Out A Puffin! I had my first trip of the year down to Fowlsheugh on Thursday, despite the absolutely howling wind it was nice to get back on the cliffs again and see the first of the seabirds heading back in to their nest sites. After a few days of very hard work, the bridge repairs at Fowlsheugh have been completed and the reserve is now open as normal. After the recent storms and high winds there has been quite a significant amount of damage to the steps and one of the footbridges at Fowlsheugh. We're decided to close the reserve until we can repair the damage and make the path safe for visitors again. Nice to get out and about in autumn. Bit of a magical mystery tour for us workers yesterday, which involved my being dropped off at Fowlsheugh to do some maintenance work to prepare for winter. Yup, like in that famous TV series, WINTER IS COMING. So I wrapped up tight and prepared to face the direwolves. I mean elements. Despite the weather the walk went ahead with an American couple who had planned specifically to visit after reading about the cliffs in Lonely Planet! They had arrived from the States in the afternoon and driven up from Edinburgh. The busy sea bird season is now fully under way with thousands of Guillemots, razorbills, Kittiwakes and fulmar hugging the cliffs. So with the sun shining we made the most of the late May weather in order to carry out a full colony count at Fowlsheugh. A trip yesterday, just to see how things are going. I managed a few photos, I am trying for flight shots - have a look! A pan-European group attended the walk on Thursday evening. A Swedish couple showed me their photos of Great Grey Owls taken during a recent invasion in Sweden while we waited for the group to assemble - very jealous! A German couple of "returning birdwatchers" - getting back into it after several years and 5 locals met at the gate in a gloomy but not wet evening. This summer at Fowlsheugh, you may well come across a couple of people catching our seabirds. Don’t be alarmed by this, it’s all part of an important RSPB seabird research project. The most important thing to say, is that the birds are not harmed in anyway and it will not disturb them from their busy breeding season. The bad weather continues, but I was joined by 5 participants for a wet walk along the cliffs. Lots of Fulmars were present - hanging in the air at the cliff edge showing off their flying skills in the updraught. The breeze was off the sea allowing us all to appreciate the smell of the thousands of birds. 9 participants joined me for a blow along the cliffs on Sunday afternoon. The wind made viewing tricky, but I was able to find a Puffin early on, which took the pressure off (one lady telling me at the start that she really wanted to see one, having never done so - no pressure there then). Despite the heroic efforts of the RSPB staff earlier in the week, in the wind and rain, it was decided that the first Puffin walk of the season last night (10/05) should be cancelled. Strong wind and rain would have made it a miserable evening, I hope that all who had booked will re-book onto a later walk. Every Thursday evening, and second Sunday afternoon starting this Sunday (13/05). A blizzard of kittiwakes and a mystery Gnome-more!